When I travel I always try to find unique places to visit or to eat. Over the years I have found the food network show Diners, Drive-Ins and Dives(or at least their web site) to be a valuable resource to find unique places to eat. As soon as I knew I was visiting the Tampa area, I looked it up and picked Keegan’s as a place I had to try. I started with an appetizer of shrimp leones. 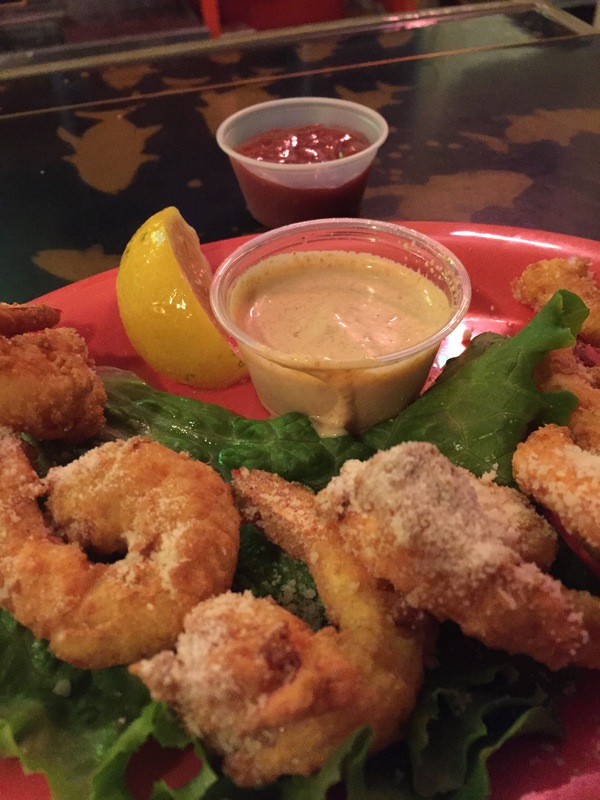 This is battered and fried gulf shrimp served with a spicy aioli sauce. The shrimp were good, not over battered or over fried, but once you dipped them in the aioli sauce they became exceptional. For my entrée, I ordered the parmesan encrusted MahiMahi grilled with a bake potato and slaw. The fish was fresh and grilled to perfection. The parmesan gave it just the right amount of crust. The fish was served topped with a salsa of tomato and black beans which added great texture. What makes Keegan’s really unique is the people. The staff was funny, friendly and helpful. They seemed to be having a good time at work. Keegan’s has been an institution in Indian Rocks Beach since 1985. They are consistently a top 100 restaurant in the Tampa area and were voted Best Place for Lunch three straight years. They serve imaginative seafood dishes and have a cool kids menu. Website: Keegan’s Seafood Grille, Inc. The shrimp looks so good!